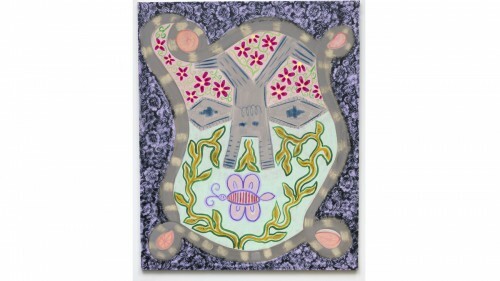 Tamara Gonzales was born in Madera, CA in 1959, she lives and works in Brooklyn and Bovina, NY. She received her A.A.S. degree in Fine Art from Parsons and her B.A. from Vermont College ADP. Gonzales says, "I consider myself an abstract painter. So while I am using a figure that lends to a narrative, I choose to stay fixed with the non-representational concerns of painting and a shallow frontal space – it's about inspiring an audience to dream." Recent solo shows include Ometeotl at Klaus Von Nichtssagend Gallery in New York and Ó Lua at the Pit II gallery in California. Gonzales has shown her work in numerous group shows every year including exhibitions in London, Berlin, NJ, Brooklyn, Amagansett and NYC since Other Rooms in NY at the Ronald Feldman Gallery in 1995. She has been awarded residencies around the world including CCA Andratx in Majorca, Spain in 2012, in 2008 iaab in Basel, Switzerland, Sanskriti Kendra in New Delhi, India in 2001 and in 1999 Yaddo in New York. Her work is in the collections of Bowdoin College Museum of Art, The Bronx Museum of Art, Colby College Museum of Art, and The High Museum of Art.